Docking stations are so dated, now you can get great sound from your iPhone or Android device without the wires. Bluetooth speakers offer a great way to enjoy your music without having to tether it to a set of speakers, meaning you can sit back and relax to your favourite tunes and still have them all in the palm of your hands. While some Bluetooth speakers offer value for money, others are packed to the rafters with features. Some favour form over functionality while others go for sounds rather than looks. Whatever your tastes, we have the Bluetooth speakers to suit your needs. UE ROLL is the powerful and pint-sized wireless Bluetooth speaker that brings unapologetically awesome 360-degree sound everywhere – loud, crisp sound that shouts through the air and bass that busts out incredible beats. It’s waterproof and designed for adventure so bash it, dunk it, drop it, or slam it. With its 9-hour battery life, 20-metre (65-foot) wireless range, and attachable marine-grade bungee, it’ll go as hard and long as you do. Use the companion app to access regular over-the-air speaker updates and an expanding set of awesome features. It just keeps getting better with time. The BTS-360 is a high performance, stylish Bluetooth Speaker that allows users to wirelessly stream audio from any Bluetooth-equipped smartphone, MP3 player, tablet or computer from up to 10 metres away. Also featuring NFC (Near Field Communication), users can simply tap the BTS-360 with their compatible device for instant connection. Although standing less than 20 cm tall, the BTS-360 delivers considerably more bass than expected from a speaker of this size, thanks to the internal bass reflex chamber. Combined with the 360° omnidirectional sound delivery, the BTS-360 delivers an enhanced and clear room filling sound no matter where it is placed. Its compact and tough design means it is perfect as either a desktop speaker system or for those who travel while its long-lasting eighteen hours battery allows you to enjoy extended periods of listening. The SoundWave delivers crystal clear sound through its powerful twin speakers with a passive radiator for increased bass, perfect for listening to music both indoors and outdoors with friends. The party will last all day with its superior functionality, six-hour battery life and rechargeable lithium-ion battery. 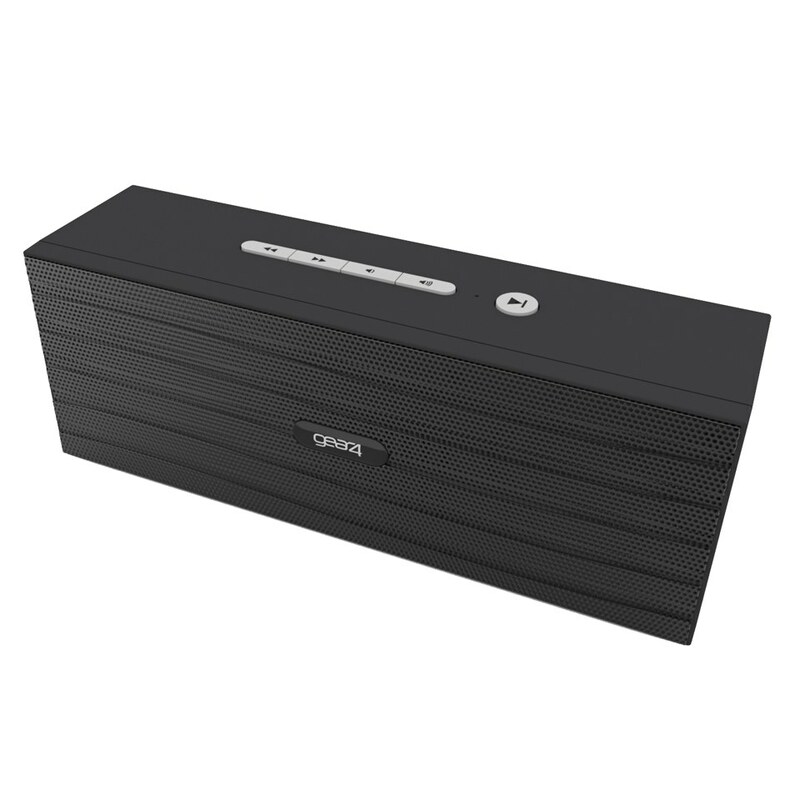 With a Bluetooth range of 10 metres, the SoundWave speaker allows friends to share their favourite tunes via compatible smartphones, laptops or music players to rate each other’s playlists. Don’t have a Bluetooth device? No problem, just connect the device to the SoundWave’s line in port and its Micro USB charging means even if the battery is getting low, hook the SoundWave up to a laptop or power bank to guarantee the party doesn’t stop! With its compact and soft touch finish design, the SoundWave is the perfect portable accessory for those who like to who want a robust speaker to blast out their tunes. What’s better than a single Bluetooth speaker? A pair of Bluetooth Speakers! This nifty prism-like portable pair of 5-watt speakers pack a punch at home or on-the-go, bringing surround sound quality that’s unusual for Bluetooth systems. Users can experience a world of warm, rich balanced stereo audio anywhere they wish and for a price to suit their wallet. Set-up couldn’t be simpler, ensuring a fast and easy connection via Bluetooth (v4.0) pairing to smartphones, tablets, laptops, PCs, within seconds, enabling users and their friends to share their favourite music instantly. For added convenience and functionality, users can also change tracks and adjust volume directly from their smartphone and tablet. The MS515 can also be used as your wireless TV speakers to generate true stereo sound if your TV or set-top box is Bluetooth enabled if not, a Bluetooth transmitter can quickly add a wireless connection to any set. Bluetooth convenience, socially responsible craftsmanship and impressive audio quality transform the Chant Mini Portable Speaker into a world of sound. Crafted with exclusive REWIND fabric covering, blended bio-plastic, and recyclable aluminium, The Chant Mini balances style and substance equally. FUGOO speakers are the first completely waterproof, mudproof, dustproof and drop-proof Bluetooth speakers, with an unprecedented 40-hour battery life, interchangeable jackets and a range of accessories, making them suitable for any environment. The FUGOO Style jacket mixes portable elegance with durability, and its clean lines and classic look help it blend seamlessly with its surroundings. FUGOO speakers pack a punch with 360-degree audio thanks to six speakers housed inside a tiny unit and also feature an omnidirectional microphone fully compatible with Siri and Google Talk. The Divoom Airbeat-10 is a portable Bluetooth speaker with a suction cup and resonating technology that turns any hard flat surface into an extra subwoofer that amplifies the bass. Its splash-proof feature and portable design make it an ideal garden companion, and its bike mount creates the perfect speaker to listen to music both inside and outside the home.